They say that all good things come to an end, and apparently this is also a truism for great things as The Scaredies undertake their farewell tour Enough Already. One of Australia’s best musical comedy acts call it a day. Unfortunately there farewell tour is not as long as John Farnham’s. Regardless whether the songs are lyrically simple or musically complex they are comedically timed to perfection. This show is mainly a “greatest hits” tour with one or two new songs/variations thrown in for good measure. Fans of the duo will not be disappointed, people who are seeing them for the first time will be – because they did not discover John and Rusty earlier in life. 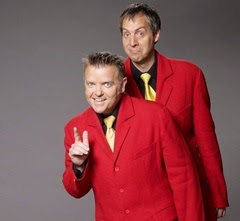 If it is not annoying enough that the Scaredies are great musicians and hilarious comedians they are two of the nicest guys to boot. Audiences are sure to enjoy watching (and maybe participating in) the show as much as John and Rusty appear to enjoy performing. Do not miss the chance to say goodbye to the boys.